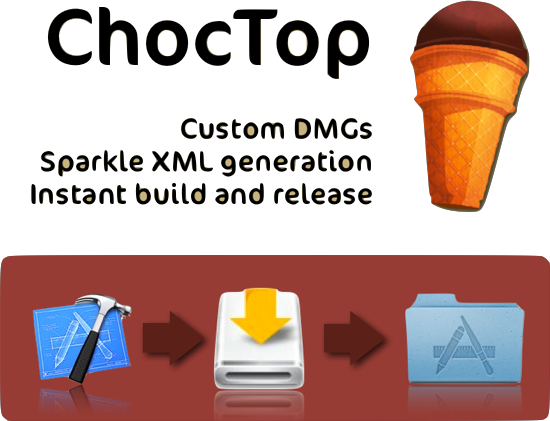 ChocTop packages and deploys any Cocoa application in a custom DMG, with generated Sparkle XML support. You also need to add Sparkle to your project, and the Info.plist properties such as SUFeedURL. I’m very sorry. It is perhaps too easy. It probably should be harder to make it seem more useful. The very cool part is that when the DMG is being designed + constructed from your Rakefile settings you actually can see it happening on the screen. The AppleScript that is executed actually operates upon the DMG whilst it is mounted, before unmounting it, compressing and read-only-ifying it. Its pretty to watch. made by Dr Nic | sponsored by Mocra | thank you to all contributors!